The Feminine Gift: Advent, in which we wait and prepare. Advent, in which we wait and prepare. Our regularly scheduled blog post has been hijacked and tucked away for safe keeping in order to chat about Advent. Don’t you love Advent? I know this can be a particularly busy, stressful – and for some, an emotionally difficult time of year. Even with all the scramble to prepare baking, all the special housekeeping, the unpleasant foray into shops and malls, I do feel an underlying peace in these days of preparation. I love that winter is still new enough that we’re not yet tired of colder weather and fresh snowfalls. I so enjoy the window displays of homes and shops, and seeing how the city streets have been decorated. I appreciate the general expectation of goodwill among men at this time, and how we’re thinking of others when we send out cards, buy little gifts, make a donation, or volunteer our time. Advent comes at a time of year that seems to be naturally reflective: the year is drawing to a close, we’re remembering Christmases past, and invoking long practiced traditions. Traditions. Every family has their own way of observing Advent and preparing for Christmas. In our home, there were key events I looked forward to every year: the making of the fruit cake. If mom made it early enough, it would be quite tipsy come Christmas day. The tipsier, the better! 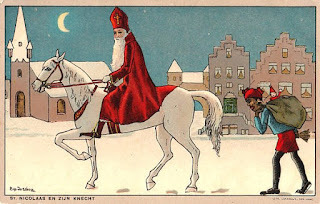 St. Nicholas (Sinterklaas in Dutch) on Dec. 5 when we would put out a shoe and hope to get treats rather than coal, and have a veritable feast of cookies and chocolate letters. The gradual bringing out of Christmas decorations including the Nativity scene; the Three Wise Guys who travelled around the living room closer and closer to the Nativity each day; the nutcrackers that looked like soldiers; and best of all were little brass angels hanging in a circle over little candles. The warmth of the candles caused the angels to spin, striking little bells – angels and bells, what could be better than that? We put up our tree on Christmas Eve day, and decorated it that evening. Then we’d retreat to our own rooms to wrap our presents, sneaking downstairs to hide them under the tree as they were done, one by one, tiptoeing into each other’s room to wrap certain presents together, and making a very big deal about being in on a secret. 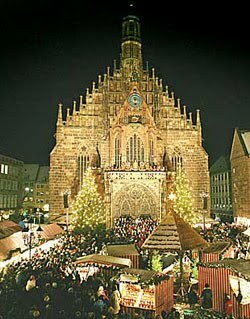 Then, the pinnacle of waiting: Midnight Mass – such a beautiful liturgy. And of course the treats that come only at this time of year: Stollen with marzipan, tangerines, and eggnog! One tradition I particularly loved was “Christkind” or Christ Child. We would draw names within the family, and for the person whose name we drew we would do something nice every day without them knowing who did it. 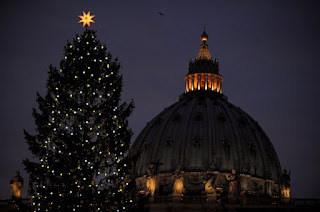 We would buy one small gift for that person which we exchanged on Christmas Eve after Midnight Mass, usually with a great deal of teasing along the lines of “I wonder who this gift is for” and trying to mislead the guessing about who had who as their Christkind. Gift giving at Christmas tended to be low key in our family, so the Christkind gift was a highlight. Finding ways to do random acts of kindness in our small family, in what was often a very small home without any other family member figuring it out required stealth, ingenuity, and imagination. It was also a great deal of fun. While each of those things was enjoyable for its own sake, they all certainly heightened our anticipation for what we'd been waiting for: Christmas itself. I am living on my own this year, so most of those well loved traditions are not possible. Instead, I have decided to prepare for Christmas quietly, with a mini fast as spiritual preparation for the coming of the Christ Child. I will limit my internet access at home, and there will be no running across the street to buy cups of London Fog tea while at work. Oh, how I do love that London Fog tea! I will do a thorough clean of my cozy apartment, and choose a few of my favourite decorations to dress it up a little in honour of the season. I will keep you all in my thoughts and prayers with the intention of a holy and peaceful Advent season of preparation. We’d love to hear from you. What are your Advent traditions? How will you be preparing for Christmas, physically and spiritually? Even now, when we are all moved away from home, we still choose Kristkindle names - and try and do something special for our "KK". I love how we would get so into tricking our KK's into thinking we were someone else by disguising our handwriting, or getting a sibling to deliver a candy or note. Then we'd open all our presents Christmas Eve, and Christmas morning was for stockings and mass and then food and games and organizing all my presents. Now we make gifts for our KK's - and we've gotten pretty creative in our old age, as there's been every kind of gift under the sun. We still tease each other about some of hte funniest gifts - like the "de-CAP-atator" which was a wooden box with a motor attached to it that took the caps off of beer bottles automatically, or the "Box with a Rope in it"...which was a box....with a rope in it....and a list of 100 things to do with a rope and a box. Hilarious! Makes me just love Christmastime! Our family also does the small acts of kindness, but we put a straw into Jesus' manger every time. Another special way we prepare is lighting the advent wreath every night and meditating on the path to the stable with a Bible verse. This year I am also writing Christmas cards (I did not send any out last year). It doesn't sound very spiritual I guess, but I find that there is much food for thought in finding a good quote from the saints to include. We are incapable of fully understanding the immensness of Advent and Christmas, but reading meditations of the saints opens an incredible window to the beauty and glory of God. Here is a quote from Fr. Raymond, a Trappist Monk, who wrote many spiritual works (it is very thoughtful). "Out of Love God became man that in love He might climb the cross and make of it an altar on which to say His first Mass. He offered that Mass that men might be lifted up to the very level of God, share in His nature, live with His life even while here on earth, be made God's very children and legitimate heirs to His heaven." God bless, and have a wonderful advent. Sarah, the Box With a Rope In It is classic! I love the idea of homemade gifts. Have you read The Trapp Family Singers? Maria's descriptions of how they kept Christmas and birthdays are beautiful and inspiring. Frances, writing Christmas Cards are a very thoughtful way to keep family and friends in the forefront of our minds during this season. I also like the symbolism of putting straw in the manger - our acts of kindness offer comfort to the Christ Child! Thank you for sharing the reflection from Fr. Raymond. It sums up the whole of Salvation history rather well, doesn't it?